Super Hero Boy: A Child to Cherish this Valentine's Day! A Child to Cherish this Valentine's Day! I think sometimes I'm just way too sentimental for my own good. While most parents are out shopping for the coolest newest toy out there when I have free time I'm usually out looking for toys that I think will leave a lasting impression on Connor. Toys that stand the test of time and don't loose their thrill after the first week. Don't get me wrong I was just as worked up about Kota and Elmo Live at Christmas and you better bet I went to every store on earth looking for the hot toys. However, if I'm just out looking I'm always drawn to more vintage styled toys that will be as cool today as they are when I have my first grandchild. I just have to find a place to store all these things once we are done with them so I will have them when that first grandchild arrives. A Child To Cherish offers beautiful gift ideas for every child on your list. From hand print kits to vintage looking keepsake suitcases your bound to find something that will thrill the kids and bring on a sense of nostalgia with the parents. Personally I'm in love with the Buttermilk Collection Crayon Aprons. 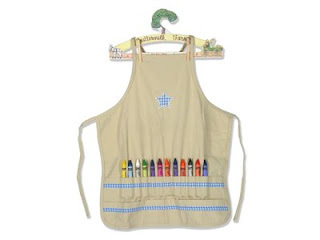 A crayon apron has been on our wish list for quite some time! Connor is big on coloring, however most of the aprons I've seen are either a bit on the girlie side or feature incredibly loud prints that distract from the art at hand.. Connor's art! When I saw the crayon aprons from Child to Cherish's Buttermilk Collection I knew I had found just the perfect thing. Both the girls and boys aprons feature a very simple gingham applique on a creamy white background that's fairly neutral as the blue could go for a boy or girl easily and its really quite pretty. Connor can wear his apron to do finger painting, coloring, or even helping me cook. I can't wait for him to get just a tiny big bigger so we can make our first cupcakes together! If your looking for something a bit softer and huggable one of the most cuddly plush animals we have had the pleasure of reviewing has come from A Child To Cherish's plush collection. Daisy the Bunny, a pink floppy bunny, is super super soft that you will want to sleep with her as close as possible. She is just the sort of thing that will be treasured as a best buddy for years to come and her pink color makes her a perfect gift for Valentines Day or Easter. Alternately there is also Bo the Bear for the boys or girls who are not into pink. Both Daisy and Bo are available in several sizes so you can get just the right companion. Go check out the entire selection of gifts from A Child To Cherish! In the meantime I have a Daisy the Bunny to give away to one very lucky reader! Leave a comment on this post. Check out A Child To Cherish and tell me which item you love the most and who would you give it to! The product I love the most is "Bo" Bear 9" - the Plush animal. I would give this to my young grandson! ''A Block To Grow On'' would make a very lovely and unique gift for my niece's new baby. I really like the crayon aprons. The pink one is adorable, My Daughter/ little Artist would love it. My choice would be the "Going to Grandma's Suitcase with Blanket" this along with Daisy The Bunny would go to my most cherished First Granddaughter, Ambryanna. I like the quacker jack duck and i would give it to my nephew. I liked the buttermilk Farm boxed set. 'Mares Eat Oats' is a fave sind-a-long for my grandaughter Lily and myself. The Blanket would hold special meaning for her. Daisy is precious! I think Abby the cat is adorable! I would give it to my daughter Melody! I would lo give the "going to grandma" suitcase to my little one. Too bad my parents and parent's-in-law live in England and Belgium. This would be sooo handy! Thanks for the great giveaway! I would love to give the Allstar Baby First Baseball to my son! I love the 'Going to Grandma's Suitcase with Blanket'! I'd give this to my son so he could use it when stays over at Grandma's house. The pink crayon apron is so cute. The Lammie Pie plushes are adorable and something I could give to either my God-daughter or her baby brother. I would get the Going to Grandma's Suitcase with Blanket and give it to my son. I like the Bo Bear plush 11. I'd love the green stitched piggy bank for my new baby boy. AWW! Butter the Cow is adorable! My daughter would LOVE that! I like the BIRTHDAY BOWL, PLATE, CUP in Pink for my baby girl. I think the Pet's Paw Print is a cute idea. I'd give it to my little Spiky Dog on his little doggie birthday. That way his little paw can be up on the wall with the kids. He is a part of the family you know. He often sits on my lap when I am on the computer, but right now he's in the back yard barking at rabbits hopping about the neighborhood eating everyones grass, or drying grass. I like the green stitched piggy bank. My daughter would love one of the crayon aprons. I like the Quacker Jack Duck. I would give it to my niece. Thanks so much! I love the BUTTERMILK FARM BOX SET-YEL. I would give this to my daughter. Adorable. Thanks so much. my favorite is the "BO" PLUSH 11" and i would give it to my new born nephew. I like the Handprints Tower of Time. Wonderful item and beautiful online store. Thanks. The corn cob rattle is so cute. I would give it to my daughter. I absolutely love the bunny! I think my favorite would be the Crayon Apron in pink. Thank you! The BABY TO BRIDE BRACELET is the most beautiful and thoughtful thing I have seen in a long time! I would give it to my new goddaughter! Stitched Elephant Bank and I would give to my daughter. I love the ABC Collection Letters, and this would be really cute to give my niece her name with the letters. Thanks for entering me! My daughter is addicted to stuffed animals so she'd go crazy for this! But she'd also love the BO bear. So cute and cuddly! My favorite is the CRAYON APRON BLUE BOXED, and I would give it to my daughter. Thanks for the giveaway! I love the Stitched Elephant Bank - Large 6" in pink. I would give it to my granddaughter. I like the Stitched Elephant Bank - Large 6 in Blue and I would give it to my grandson. I really love Quaker Jack Duck for my little daughter, she has an uncle she calls Ducky and would love this, thanks so much for such a great giveaway! I am also subscribed via email, thanks again! I like the bunny, but the plush bear is also real cute. I am a subscriber and have your button on my sidebar. i like the qucker jack duck best and i'd give it to my stepdaughter. Daisy Bunny 11" is the toy I would choose for my granddaughter. Stitched Elephant Bank - Large 6"
One of my favorites is the blue Allstar Baby First Baseball. It'd make a great baby shower gift for a friend who is expecting a boy. I like "butter" the cow plush. How adorable. This would be great to give to my nephew. I love the Gingham Suitcase with Blanket and Rattle! It would be perfect for our new baby girl. Thank you! I love the "Lammie Pie" PLUSH 13" most from A Child To Cherish :) *Thanks* for the giveaway! I would get Abby the cat and give it to Rylee. I like the Buttermilk Farm Handprint Tin. Very cute to have for a newborn. Thank you! I love the 'Baby to Bride' bracelet set. Great baby gift for a little girl. One of my closest friends finds out tomorrow the gender of her baby due in June. If it is a girl, I'd give this gift to her. Otherwise it would be a very special gift to give to my youngest daughter (who already dreams of being a bride someday!). Because I am a grandma to 9 amazing babies...I love the Going to Grandmas!! I love the Lammie Pie Plush. I would give it to my baby. My granddaughter would love to have Daisy the Bunny, to add to her Bunny Collection. We are a cat family - I love "Abby" cat! Thanks. I love the Handprints Tower of Time! I would give it to my SIL, who is due with her first child next month! She loves keepsakes like this! PET'S PAW PRINT and would give it to my mother who just lost her pug of 15 years. I like the Going to Grandma's Suitcase and I would save it for my first grandbaby! I would like to give the Daisy bunny or Bo bear to my daughter who is sitting here bored at home with a broken clavicle and can't go back to school yet! What a wonderful company! They are proud participants in the Extreme Home Makeover Edition Show, kuddos to them! I love the Dasie the bunny and also like the "BO" PLUSH 11" from their site. Going to Grandma's Suitcase with Blanket" for a new grandbaby on the way. I would love the pink crayon apron. I would give it to our 2 year old daughter. She would love it! I like the "BO" PLUSH 11" and I would give it to a friend who's expecting twins. I like the Allstar Baby First Baseball for my nephew-to-be. I like the Handprints Tower of Time. I would love Dasie the bunny and would give it to my granddaughter!! CRAYON APRON PINK BOXED is great, I would love to give it to my daughter! I would get the Going to Grandma's Suitcase with Blanket for my daughter. She's been asking for a suitcase. 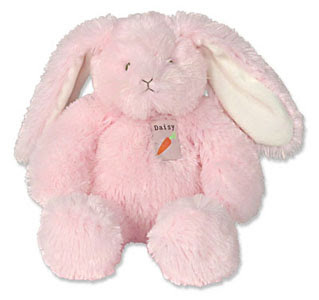 I would love to have the Daisy Bunny 13" for my daughter! The Lammie Pie plush--any size would be perfect for my grandbaby. My daughter would love the pink Birthday bowl, plate & cup set, it's so pretty! I like the LG BUTTERMILK FARM BASKETS. I would give it to my pregnant niece who lives on a farm. thanks! I would love the Corn Cob Rattle for my newborn son. I love the ABC Collection. I'd get the Butter the Cow plush for my granddaughter. I love the Baby to Bride bracelet! Thank you! Going to Grandmas suit case and blanket is so cute and my kids spend every other weekend at their grandparents house. Thanks for the contest great site. I like the going to grandma's suitcase. too cute! I like the ABC collection. Thank you. The handprint kits are sooo cool! That would be a perfect shower gift, but I actually want one for myself! I love that pink bunny, I could see it in my lil girls crib!! Daisy The Bunny is so cute, my little granddaughter would love her. The crayon apron is really nice, too. Thanks for having the contest! My daughter would love the PET'S PAW PRINT as she spends so much time playing with our dog.